In the fishing village, fish are prepared for drying. The heads and gills are removed and the fish is split up the middle along its belly. 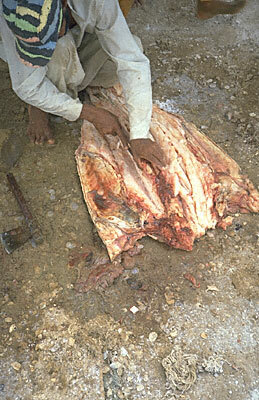 Slits are cut into the meat and salt is spread in to help the drying process. With the small catches that are associated with subsistence, heads are usually consumed. But with the scale of commercial production, heads then become more numerous than can be consumed and are generally discarded near the drying stations.